After driving around Waynesville and the vicinity for half an hour stopping at a few places on both my GPS and “Around Me” app to find them closed or virtually vacant, I finally happened upon O’Malley’s for a beer and Monday Night Football. The game was horrendous, but the fried portabella mushrooms were fantastic. For you Dallasites, they could compete with Snuffer’s. I was planning on getting a chicken sandwich, but they had turned off the grill and only kept the friers hot. 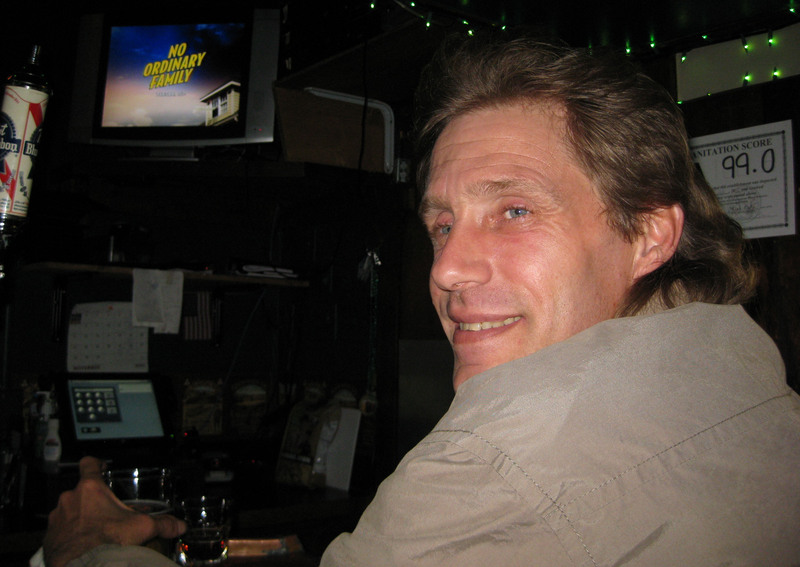 As I was nursing my draught beer, Mark took a seat beside me. He was ex-navy, ex-volunteer firefighter, ex-electrician, and current courier. While he was fighting a fire in New Smyrna Beach, Florida where he was originally from, the roof collapsed and essentially crushed his knees. It took him four years to walk without a limp! 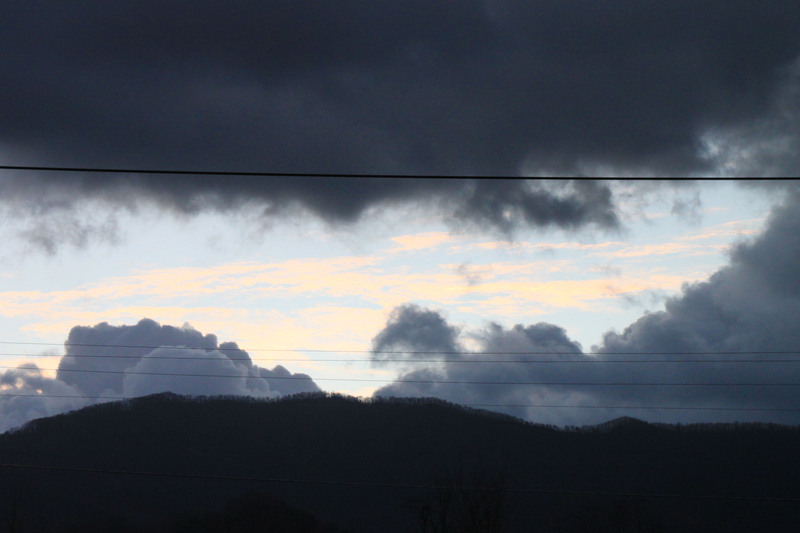 It was a cloudy morning at Walmart, yet not a bad view. 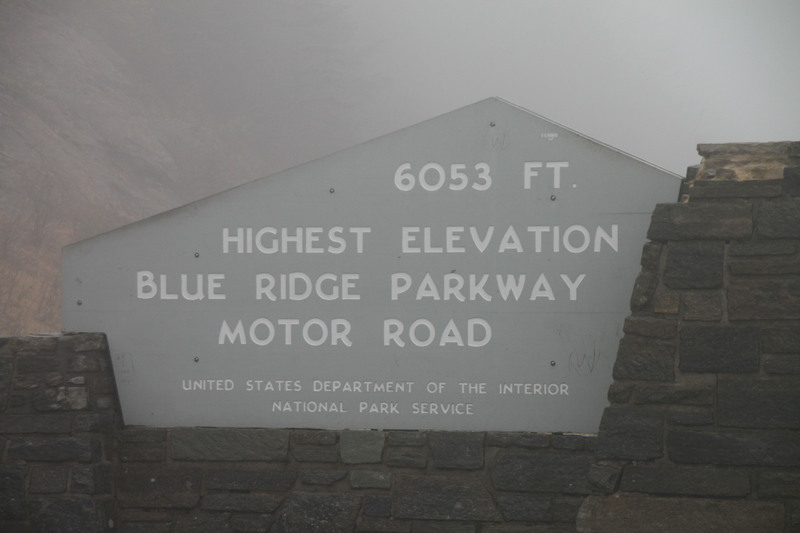 I got an early start for a day on the Southern part of the Blue Ridge Parkway. The parkway was fog covered, misty, and windy which made for a somewhat eerie visit. 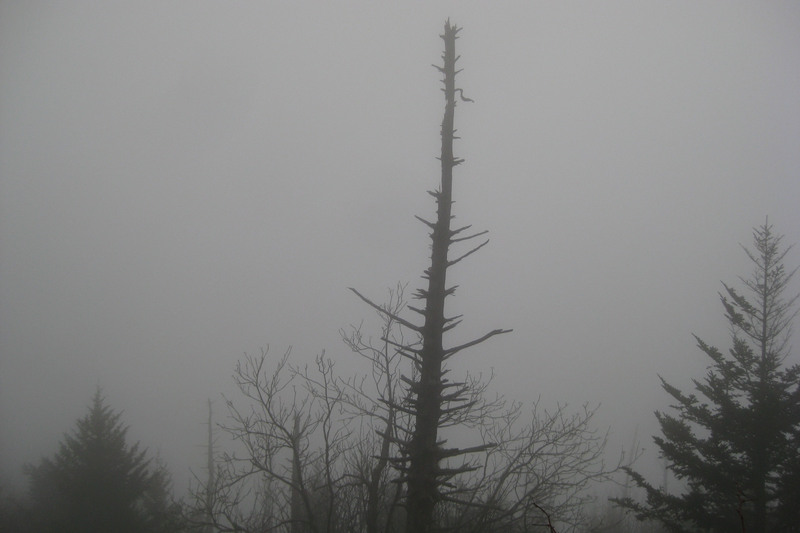 I felt like I was the only one around…no cars on the road and none at our first stop, Waterrock Knob. 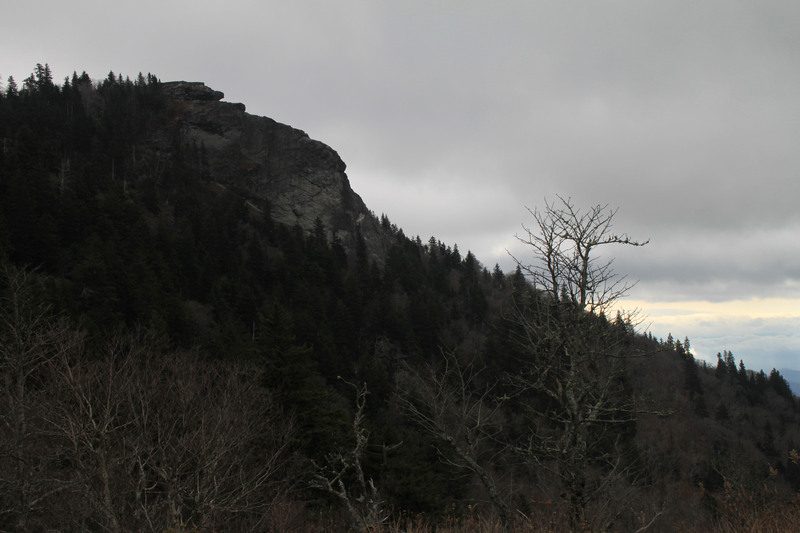 Waterrock Knob was an important location to the pioneers due to its mountainside spring. 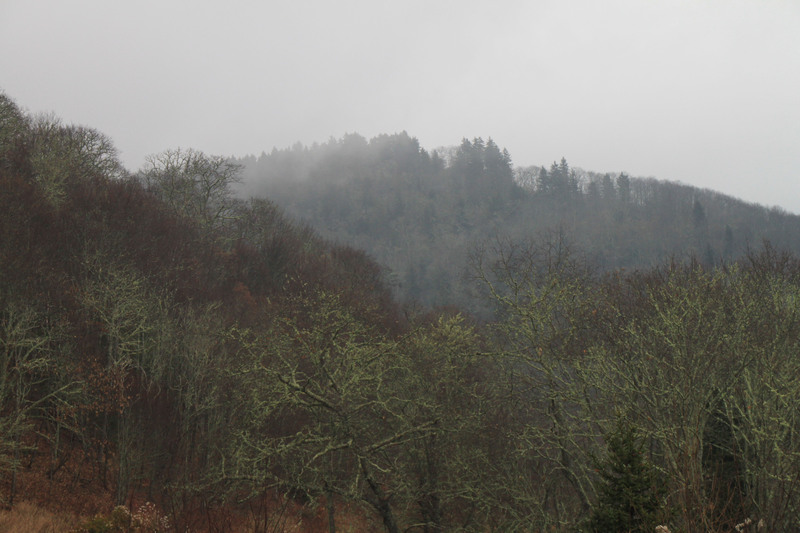 With the area blanketed in fog, I didn’t see the spring. 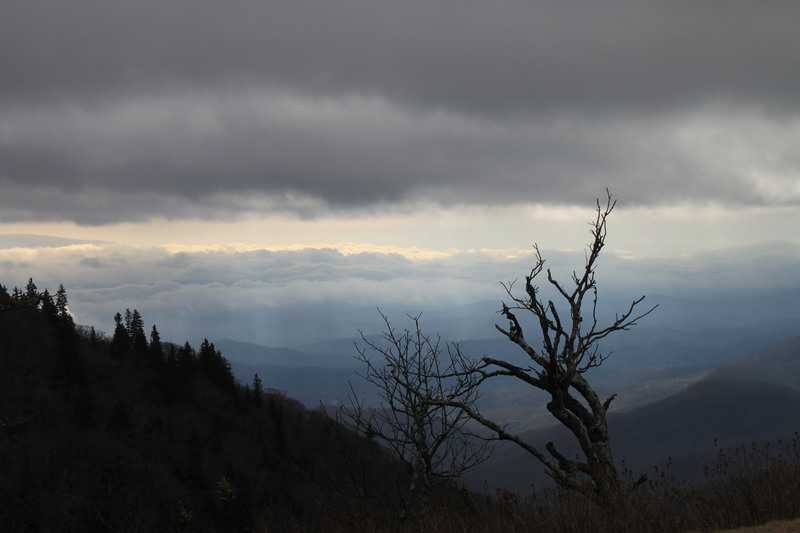 The view of clouds remained the same upon arriving at the summit after scrambling a half mile up a slick, rocky trail. I did, however, find a cache…not easily I might add. I lost reception on my phone near the summit, so without directions to the exact coordinates, I just began looking under rocks as I walked. Shockingly, I first found a “letter box” hidden by “TreasurehikersUSA.com”. I had to look up the organization online to determine the purpose of the letter box. Apparently, the association teams up with states to encourage longer hikes by offering incentive tags based on points accumulated. A handful of rocks later, I found the hidden ammo can. I supposed I wasn’t the only one on the Parkway. 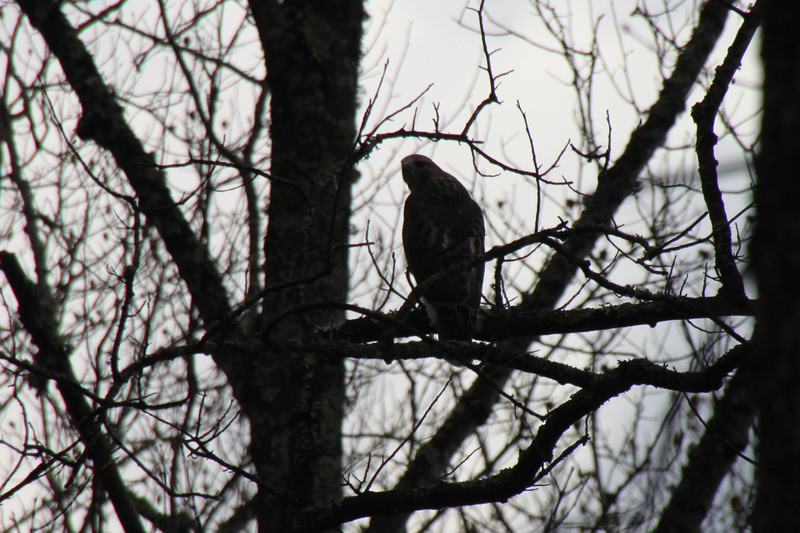 I spotted this beautiful hawk of sorts. I need Bart, the birder, to identify it. Its face and breast were very light relative to any of the other hawks and vultures I’ve seen soaring overhead. I had a perfect photo opportunity of it perched on a high, tree limb as I passed by in VANilla. By the time I reversed, parked on the grass aside the road, retrieved my camera, and rolled down the window, it decided to fly off and, of course point, its back to me. The dogs and I continued on to the highest point of the Blue Ridge Parkway at Richland Balsam. 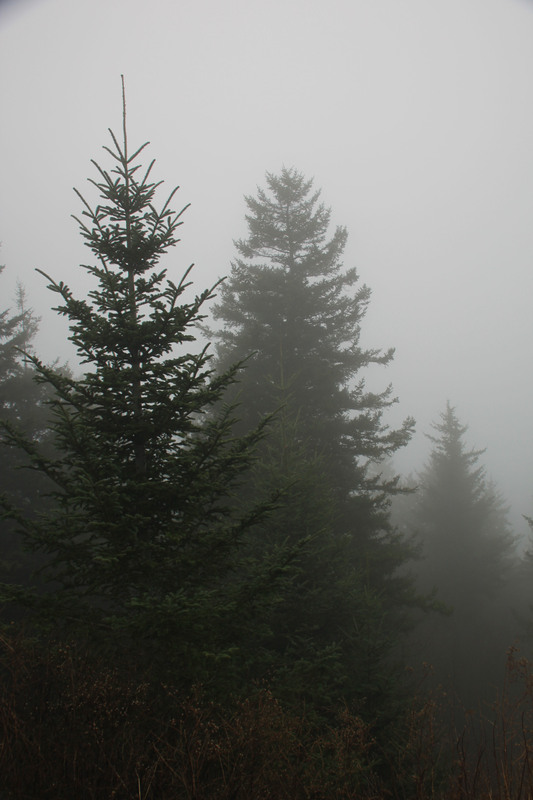 The area is covered in a spruce and fraser fir forest, though many of the fraser firs have been killed by an insect called the balsam woolly adelgid which was accidentally imported to the United States from Europe in the early 1900s. We took our next walk to the top of Devils Courthouse, a rocky summit that both Cherokees and early settlers thought was haunted by demons. The rocks conceal a cave where the devil was believed to hold court. The summit provides a splendid mountainous view. On a clear day, visitors can see South Carolina, Georgia, and Tennessee. 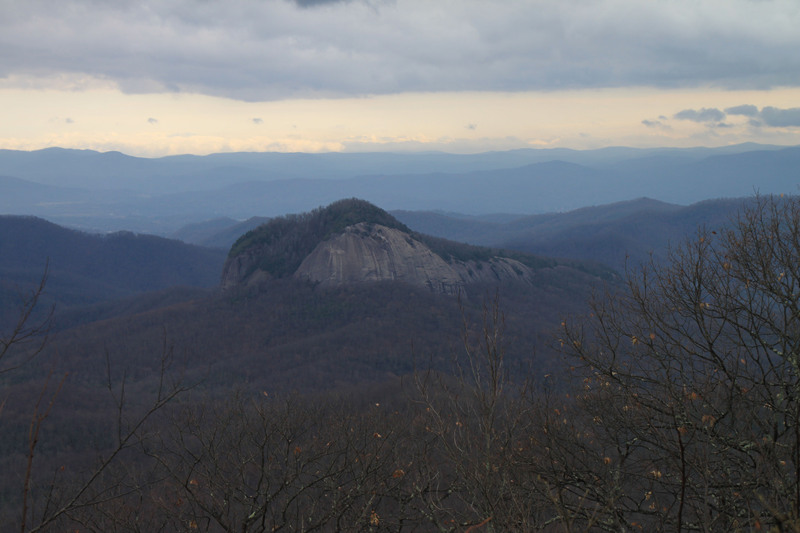 On our way to Mount Pisgah, we stopped at Looking Glass Rock Overlook. The rock is a pluton, a mass of molten rock formed underground that becomes exposed through centuries of erosion. When water or ice rests on the face of Looking Glass Rock, the surface reflects rays of sunlight like a mirror. Clearly, I wasn’t a witness to a sunlight reflection today. A movie and popcorn sounds great! Hoping to have time for that sometime before Christmas! Miss you punkin! Give Scout and Petey a pat from me!